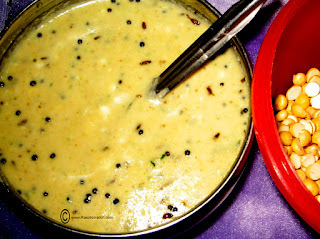 The simplest of all chutneys suitable for Idlis and Dosas ,is Putnala Pappu pachhadi. Mix Putnala pappu,Green chillies, Garlic and grind in to a paste by adding water.Take in to a bowl,add Curds and Salt to it.Garnish with the Seasoning. Serve with Idlis or Dosas,Pesarattu etc Tiffins.